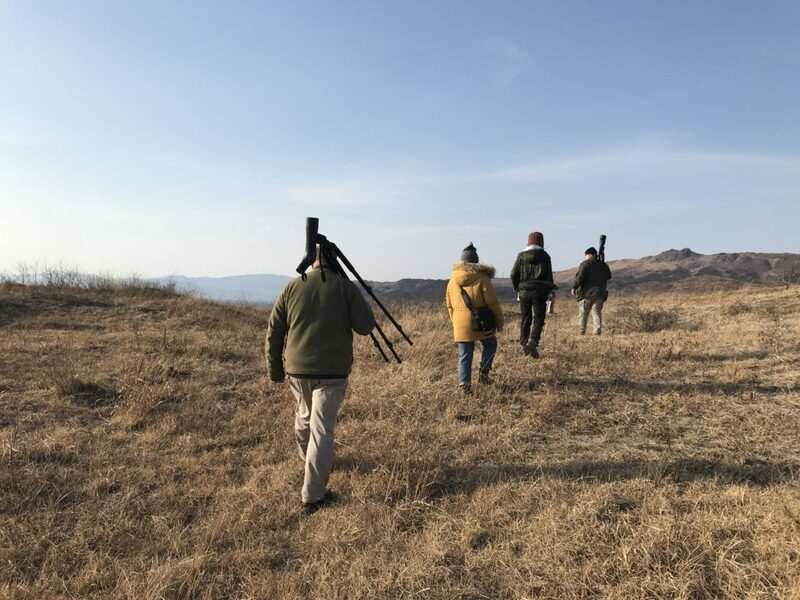 In March 2019, Birds Korea and the Hanns Seidel Foundation (Korea office) organized two short birdwatching tours to Rason in the far northeast of the DPRK, bordering on Russia and PR China. The first tour, part-funded by the HSF, included a staffer from UNESCAP and three birders from the conservation organization “Spoon-billed Sandpiper in China” (SBS in China), based in Shanghai; the second tour was more or less commercially run, and was comprised of 11 birders from the Hong Kong Birdwatching Society (HKBWS) with myself guiding, and logistical support both times provided by the International Tourist Agency in Rason. K.C. Lee at Uam © Nial Moores , sheltering from a snow squall which was followed in the next 20 minutes by views of Brant Geese, Relict Gull, Chinese Grey Shrike and a Korean Red Fox! 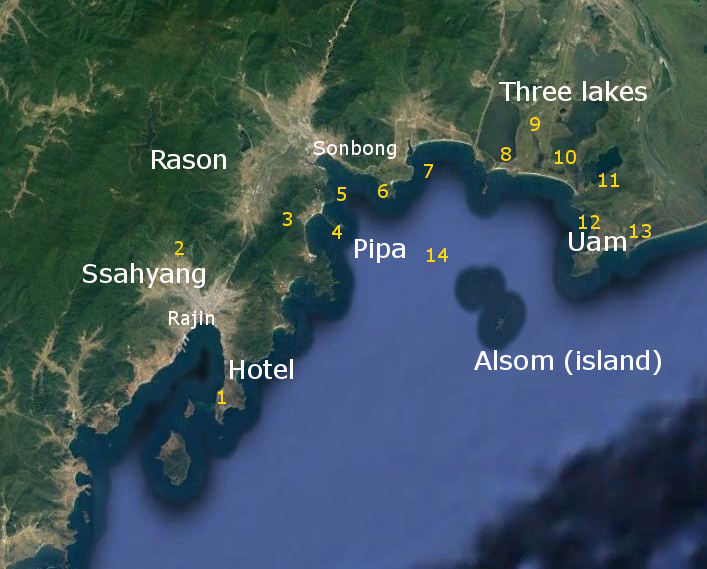 These two tours followed on from half-a-dozen HSF-initiated and funded research visits to Rason (in months March, April, June, July and November, all posted on this blog) and much of their focus was on three lakes, labelled 8, 9, 10 and 11 in the figure below, which in 2018 were together designated as an internationally important Ramsar site based primarily on our data. Some of the main sites in Rason marked on a Google Earth image, which include forest; extensive stretches of coast; freshwater lakes and reed-beds; drier grassland; and islands used by breeding seabirds. 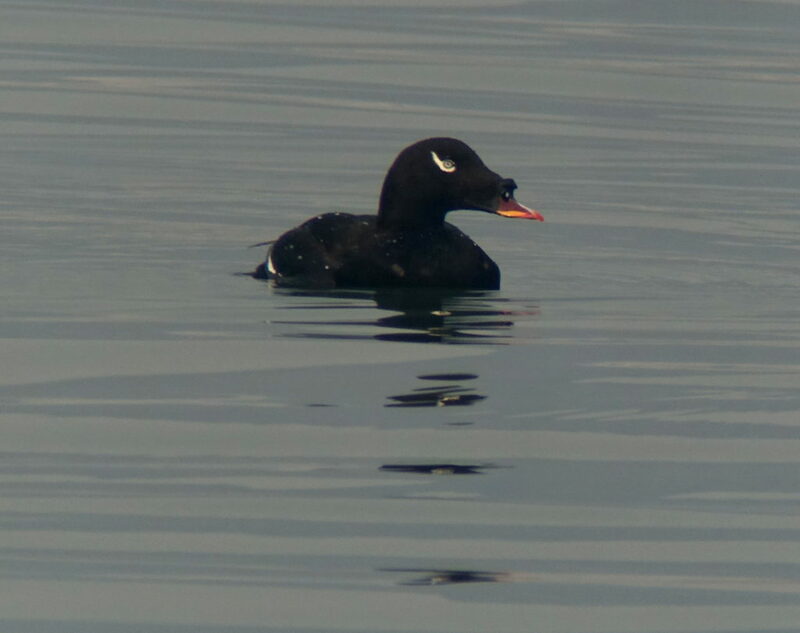 Both tours also enjoyed long periods birding the adjacent marine areas, which support many wintering scoter and species like the regionally-endemic Spectacled Guillemot (easy to see e.g. at points 4, 6, 8 and 12). 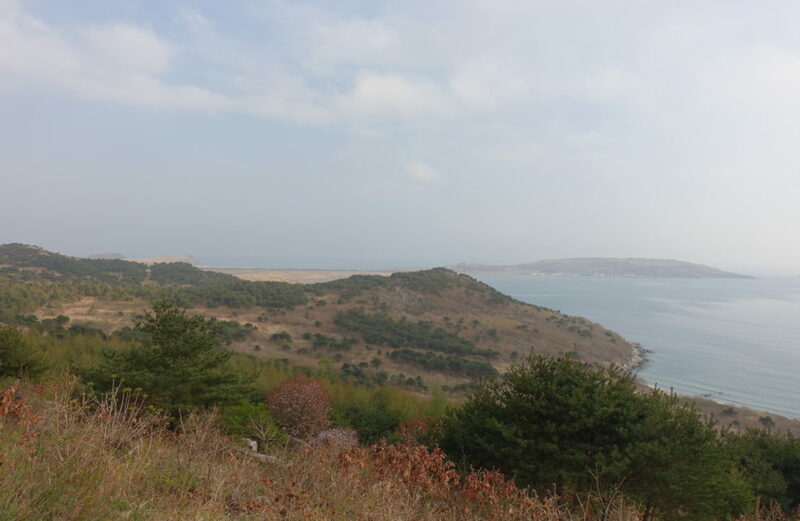 Time was also spent walking in protected forest above Pipa (point 3) and on Sahyangsan (point 2), where both Chinese and Eurasian Nuthatch breed. Forest above Pipa © Nial Moores. Good for nuthatches and woodpeckers (including Japanese Pygmy Woodpecker) even in winter; and with a fascinating breeding avifauna that includes good numbers of White’s Thrush, Siberian Blue Robin and the super-vocal Pallas’s Leaf Warbler. Hills overlooking Uam © Nial Moores. This online article hopes to answer some of the questions prompted by these two tours, including: Why organize such a tour? Is it really possible to birdwatch there? How do you get there? Where do you stay? What did you eat? And what are the people like? Why go to the DPRK? 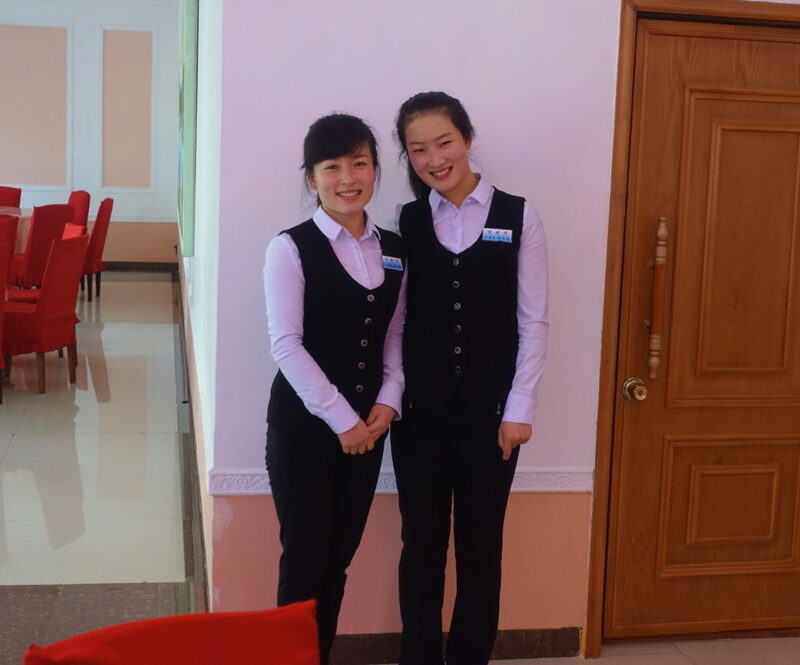 The DPRK is often described as one of the least open nations in the world; and certainly tourism there is still a niche market, with much of the fascination for potential visitors coming from a wish to go somewhere different, almost forbidden, and to look behind the curtain as it were. At the same time, even this type of tourism – in its own modest way – can help to support current political efforts aimed at reducing tensions on the Korean Peninsula by increasing awareness and mutual understanding. 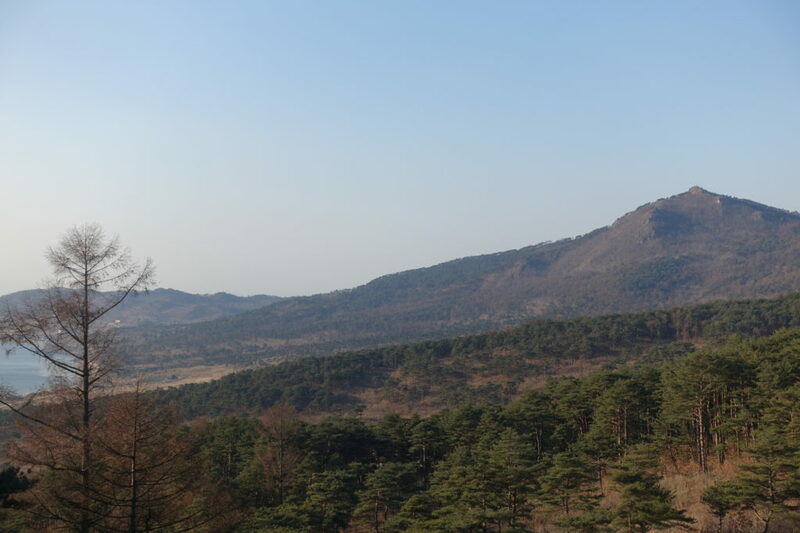 One tour company, Koryo, even offers tours that include both the DPRK and the ROK, to allow visitors to compare and contrast life there). Globally, birdwatching-based ecotourism (or avitourism as it is increasingly called) is one of the fastest growing sectors in the tourist industry (see e.g. https://www.thedailybeast.com/birding-yes-birding-is-a-multi-billion-dollar-ecotourism-industry ). In every nation, avitourism has the potential of giving financial incentive to local and national decision-makers to conserve key species and habitats; and it can be an excellent way to expose people to different lifestyles and value systems. In the DPRK, this kind of exposure really can work both ways: birdwatchers visiting one of the world’s least open nations can be surprised by what was described by SBS in China’s Yang Ziyou, as “breath-taking natural landscapes and unique cultural landscapes”. Local people also get to see foreigners with binoculars, cameras and telescopes, actively showing appreciation of the landscapes and birds that surround them. Avitourism to the DPRK can therefore offer a sustainable and surprising alternative to more destructive development projects. 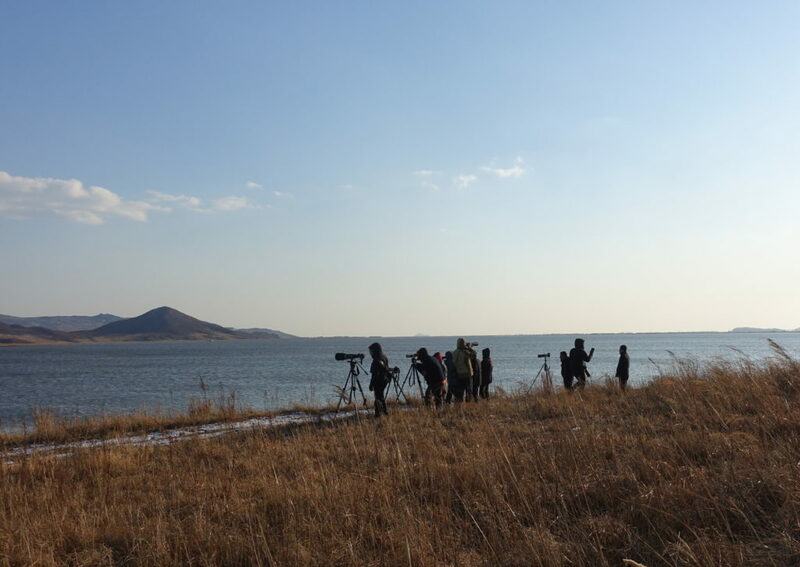 It can help to support bodies working for the conservation of migratory species within both the DPRK and the ROK through raising the profile of key sites and generating information on the status of birds within them. First and foremost, the species mix and the sense of abundance. Sobon Po, the most bird-dense of the three lakes, March 2018 © Amael Borzee. 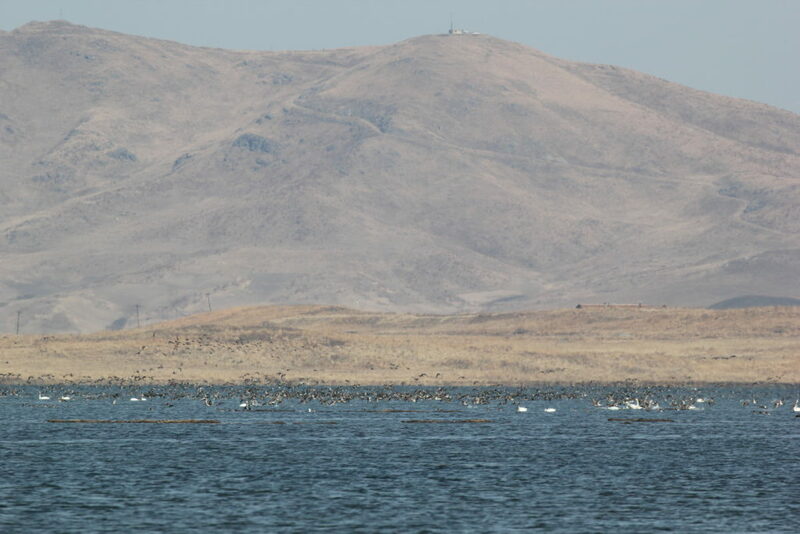 How many birds (individuals and species) can you see? 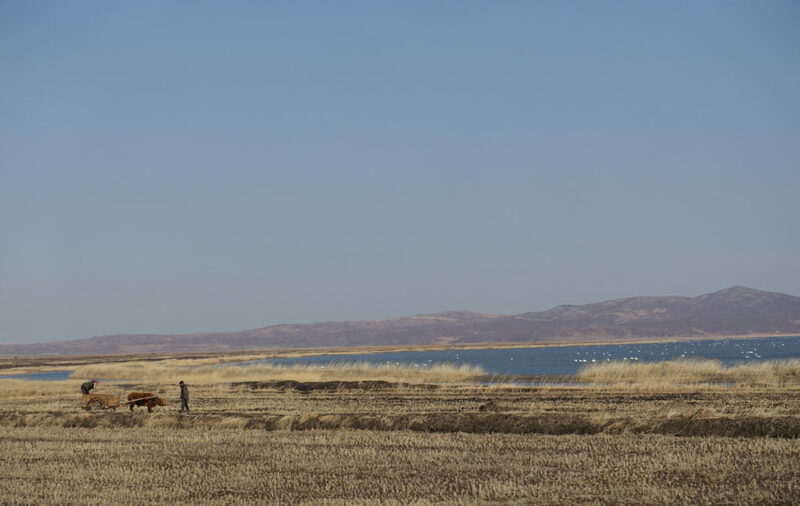 Just a few of our birding highlights in Rason have included: 1,000 swans in a day, often with three swan species in the same field of view; large concentrations of duck (including peak counts of 3,000 Falcated Duck; 15,000 Eurasian Wigeon; >2,000 Long-tailed Duck, 4,000 Stejneger’s Scoter and Korea’s only record of Surf Scoter! ); rafts of breeding-plumaged grebes (including 345 Slavonian / Horned Grebe in one flock and more than 2,500 Black-neckeds counted along 20km or so of coast the same week); breeding Von Schrenck’s Bittern; Steller’s Sea Eagle; Swinhoe’s Rail; Relict Gull; decent numbers of Slaty-backed and Glaucous Gulls; breeding Common Murre, Spectacled Guillemot and Rhinoceros Auklet, and probably breeding Ancient and Long-billed Murrelet (with between 33 and 56 of this poorly-known species seen in only three hours here); breeding Chinese Grey Shrike, Pallas’s Leaf, Black-browed and Thick-billed Warblers; resident Chinese Nuthatch and Ochre-rumped Bunting through the year. 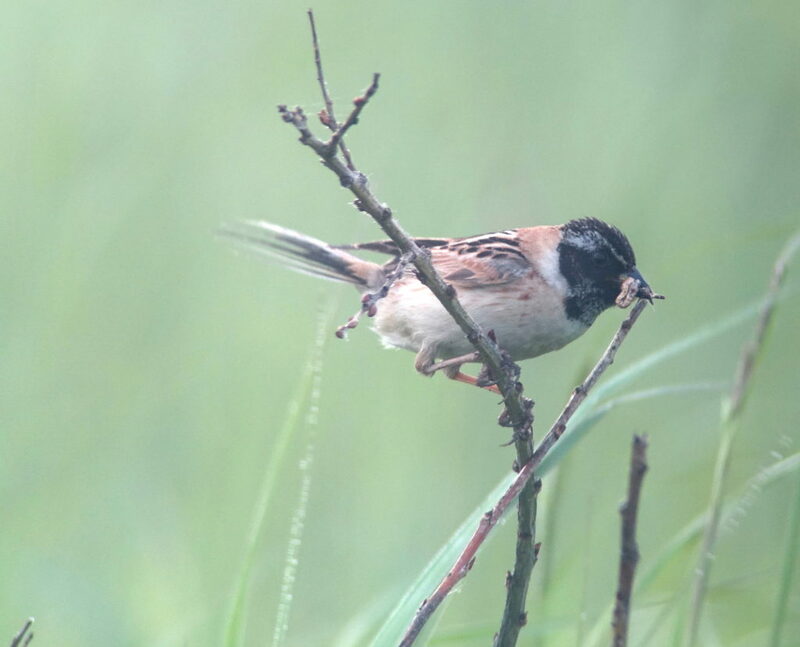 It might even be possible to see Jankowski’s Bunting in Rason: a likely male and female were seen briefly in March 2019, almost 90 years since the last series of records there. 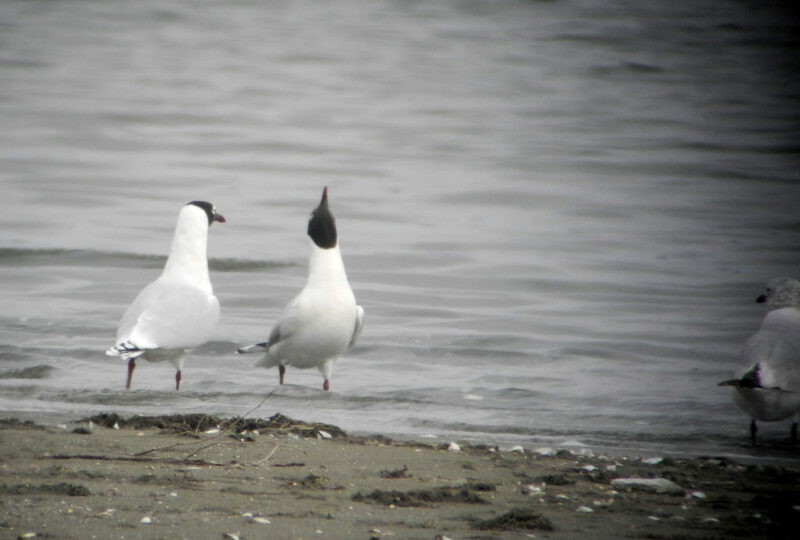 The DPRK’s first record of Relict Gull, March 2014© Nial Moores. We have found Relicts here in months March (in 2014, 2018 and 2019) and in April, June and November; and also at several east coast sites elsewhere in the country. Large raft of breeding-plumaged grebes © Nial Moores. These Black-necked Grebes were disgiscoped off Pipa in April. The fact that avitourism in Rason really could have a positive effect. 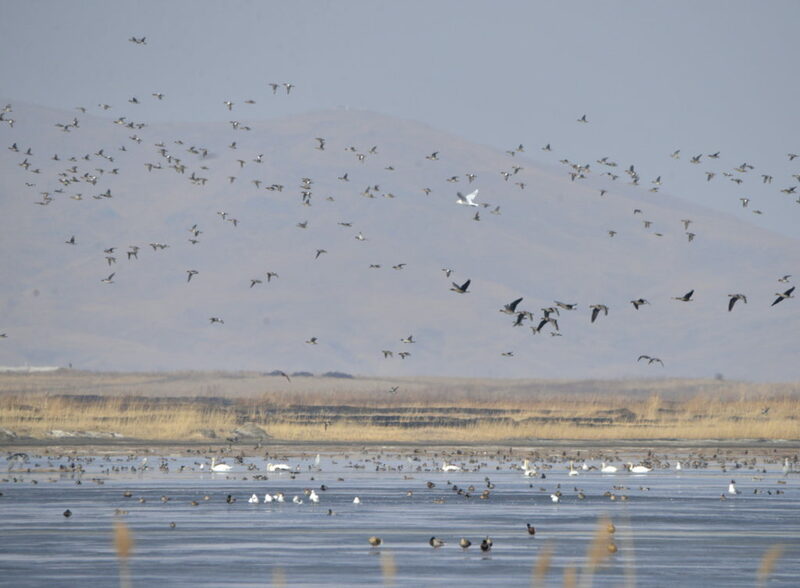 Already the research we conducted has led to raised awareness in Pyongyang and internationally about the birds of Rason; and even resulted in the designation of the wetlands in Rason as a Ramsar site. 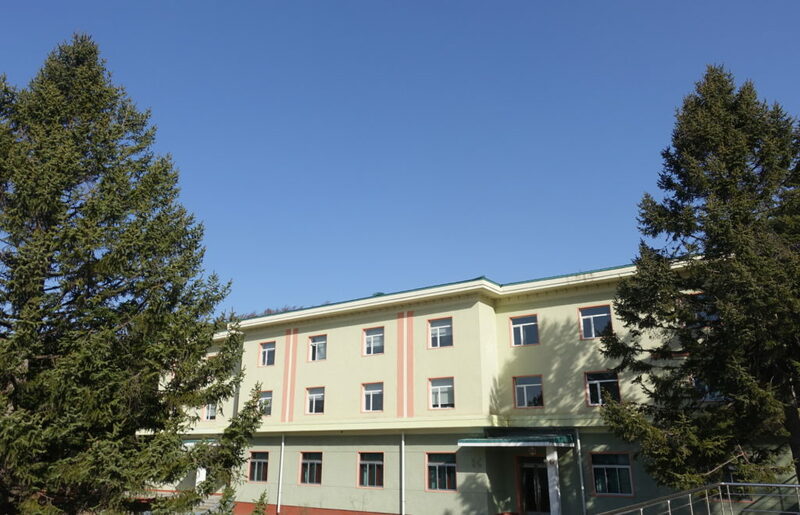 Now, both authorities in Rason and in the national Ministry of Land and Environmental Protection are keen to encourage avitourism and eco-tourism to Rason, as a model of a new kind of tourism to the DPRK. If successful in Rason, this could have a fairly strong impact on development proposals there and in other important sites nationally. The beautiful landscapes and the mix of habitats, concentrated into a relatively small area – all within an hour or 90 minutes drive of each other. 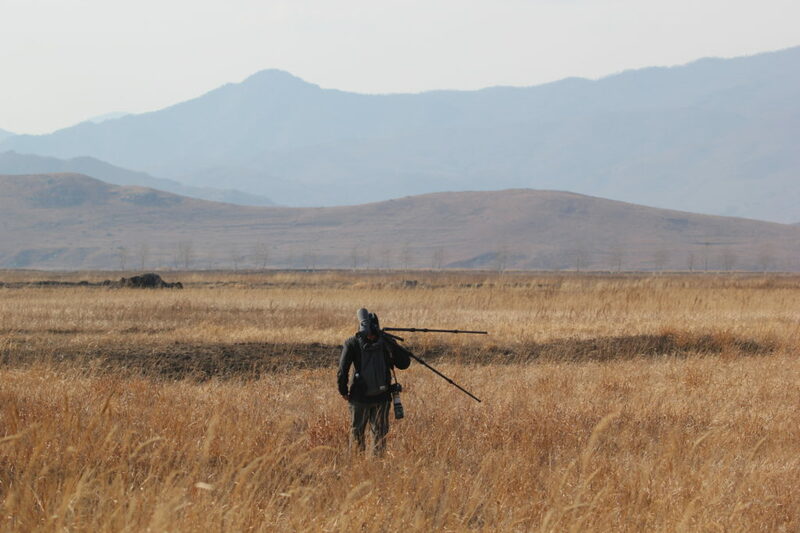 Although several of the places we have surveyed in the DPRK look much-degraded, many parts of Rason still have great natural beauty and bird-rich rural scenes that were once typical throughout much of East Asia, but which have become all but lost elsewhere following the industrialization of agriculture. Han Yongxiang sets off toward the horizon in search of buntings © Yang Ziyou. 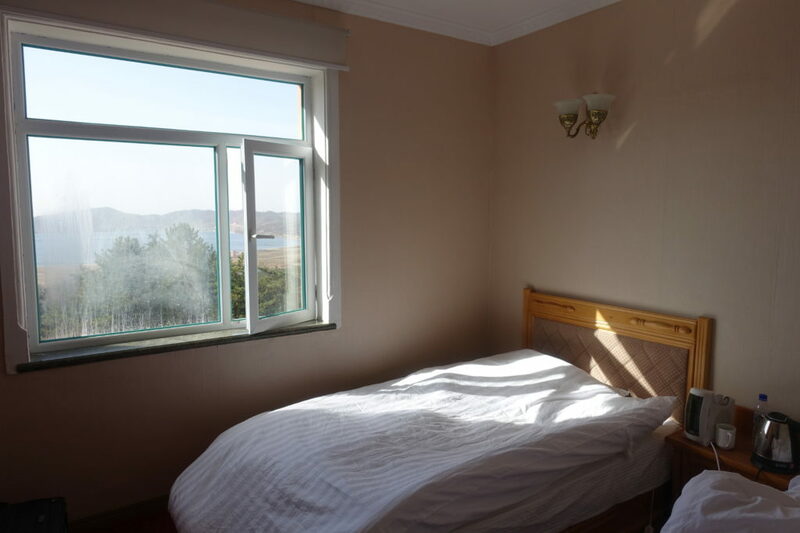 Rason already has international hotels, a decent road infrastructure and (some) administrators and guides who are used to working with foreigners. The guides who accompanied us during these two tours were very professional, good-humored and service-oriented, with one especially (“young Mr. Mun”) speaking Korean, Chinese and English. 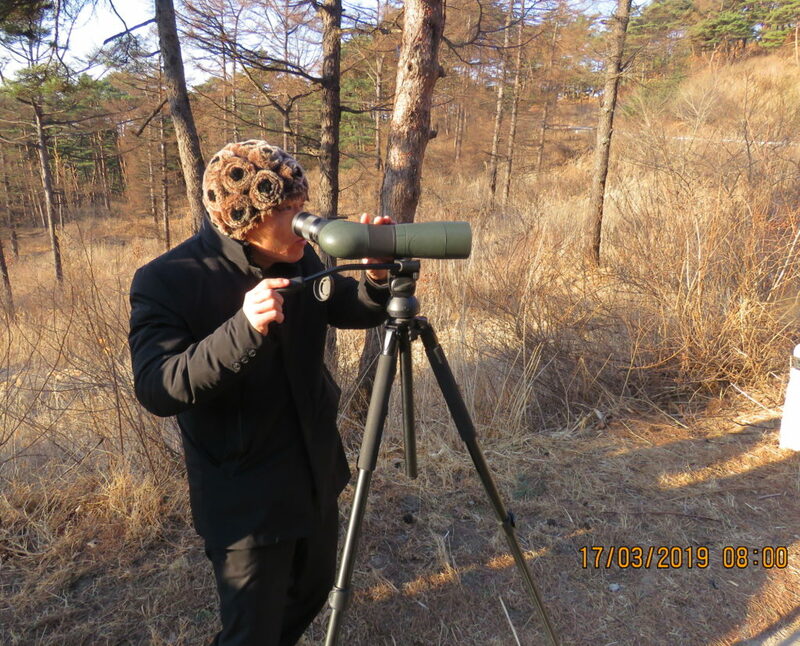 He was also very sharp-eyed, finding the HKBWS group a Korean Red Fox, and showed genuine interest in learning about birds, birding and birdwatchers. In addition, all the hotels that we have used in Rason have been clean and well-run, and especially the staff at the hotel in Pipa forest where we stayed in March were extremely helpful and prepared very good food for us each day (happily, by the second week the vegetarian options were served first and hottest…). 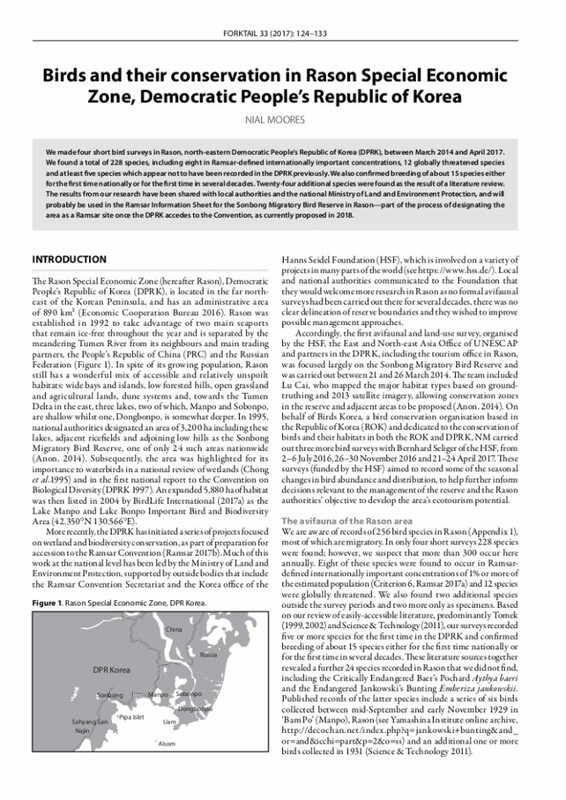 Rason also sits in a fork on the East Asian-Australasian Flyway, with large numbers of birds moving inland up the Tumen River; and others continuing along the coast into the Russian Far East. This means that there can be spectacular numbers of birds and a rapid turnover through the area during migration periods. Every day feels a little different – and we have seen over 100 species in a day (in April), without really trying. And a visit to Rason can easily be included in a tour that also spends time en-route at the Hunchun Wetlands (famous for its Steller’s Sea Eagles in March and within 20 minutes of the border crossing) and the “Tiger forest” in PR China and Russia. Probably all months between March and November are worth a visit (and even in mid-winter, there is likely to be some great birding, if you are willing to endure what would likely be severe cold). 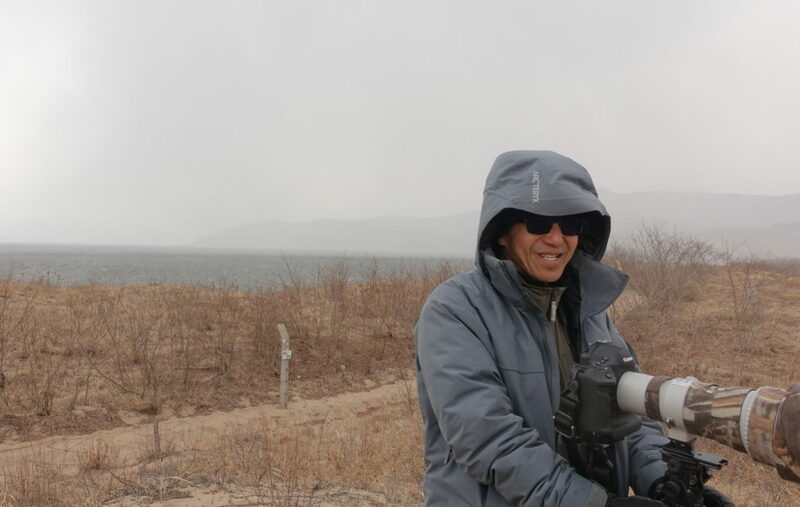 This very much depends on what you want from the trip: more leisurely birding with plenty of time for photography or a more economic quick-stop at most of the main birding spots (with SBS in China’s Lisa Guo suggesting four days and three nights, with one of these days spent in Hunchun, as optimal). Based on our visits there, I would advise a little longer. Four or five days should be enough to see most of the birds in Rason in any given season – though a longer visit would undoubtedly add additional highlights. 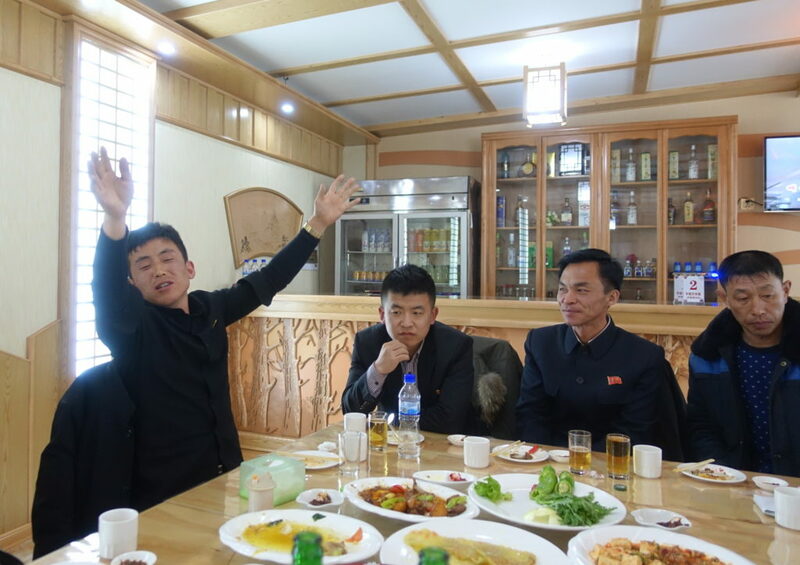 Going anywhere requires a certain level of planning and visiting Rason or elsewhere in the DPRK requires a lot of preparation. It is not at all possible just to turn up at the border and expect to pass through immigration. At this time, for anyone planning to go birding in Rason, it is essential to arrange and confirm your visit through the Rason International Tourist Agency. A proposed itinerary (which can be flexible). 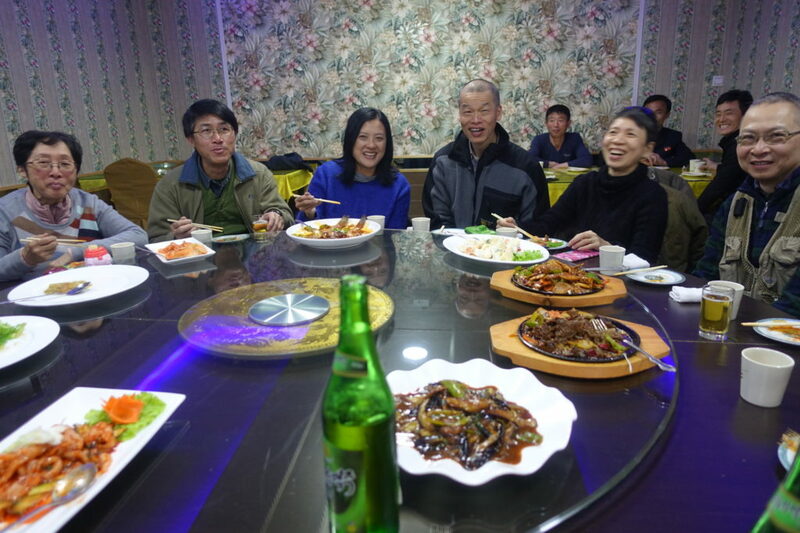 Each time I have been to Rason, I have flown to the Yanbian International Airport in Yanji (there are flights several times a week from Busan and daily flights from Incheon, Shanghai and Beijing); and then taken a rented vehicle for 1.5-2 hours to the border. This can be a taxi; or a bigger bus rented through a travel company in Yanji. 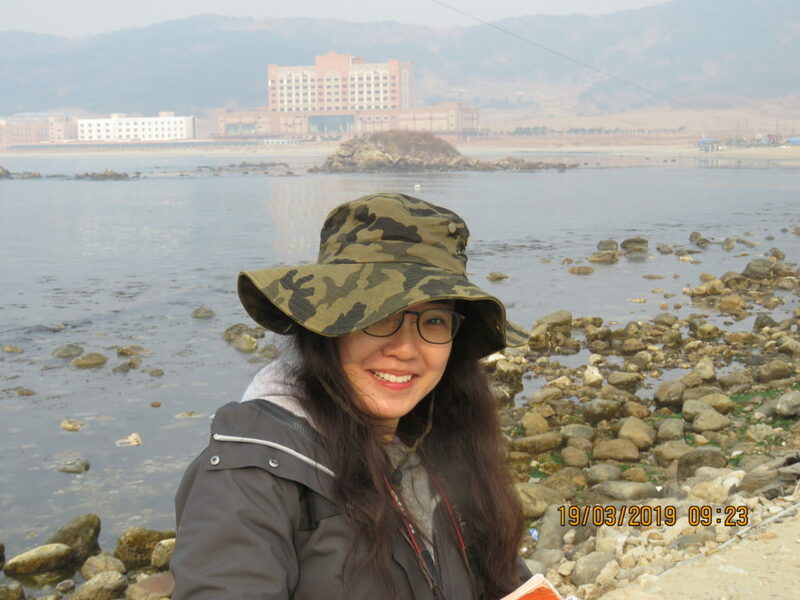 The HKBWS arranged their bus to deliver them to the border at the start of the trip; and then to transport them to various birding areas in Hunchun for several days after departure from Rason. 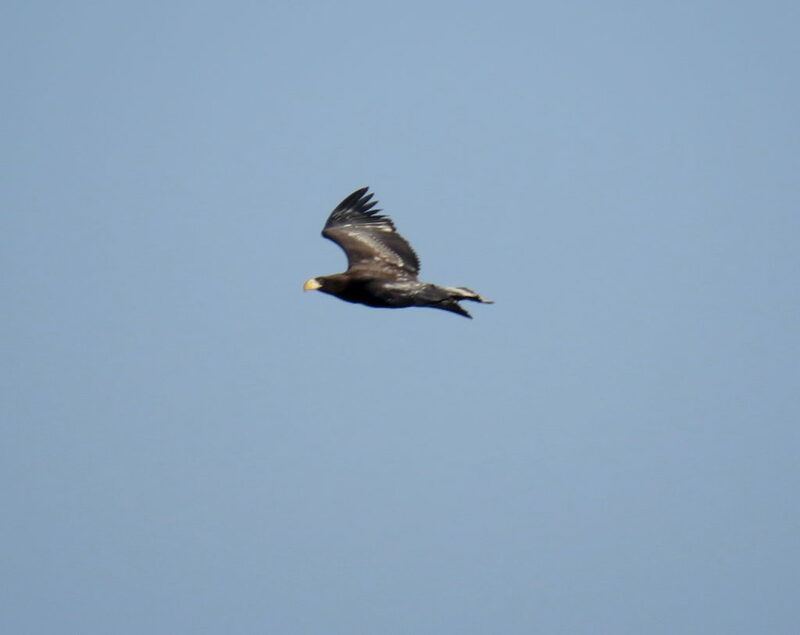 Apparently this was a fairly costly but convenient arrangement – allowing the group to see both Steller’s Sea Eagle and Black Woodpecker after we left Rason. Our surveys are introduced in some detail on the Birds Korea blog; a paper on the birds at Rason was published in the excellently-produced Forktail, the journal of the OBC; and more of the background to the rationale for avitourism can be heard in this Sound Approach podcast (scroll toward the bottom) made by Charlie Moores, the Accidental Podcaster). For even more detailed information, please contact me directly at my birdskorea email address.